Men's Shops Directory: E-Commerce - Fine and Dandy | Valet. The gentlemen behind Fine and Dandy Shop know that men who are particular about their clothes hate it when someone shows up at a function wearing the same exact tie. Thus, they strive to offer unique items in addition to classic wardrobe staples. Here you’ll find floral pocket squares, ties that make a statement and timeless accoutrements like collar pins, tie bars and cufflinks. All at pretty affordable prices. 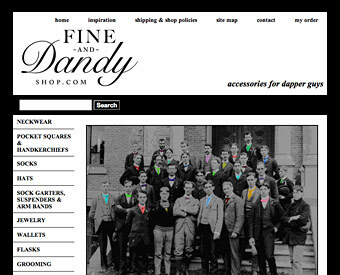 The site offers a same day delivery service in Manhattan by emailing their "Dandy 911 service."